31 tonnes of pesticide collected from Sîngerei, Drochia, Edineț and Bălți were evacuated today from the storage located in Alexăndreni village, Sîngerei. 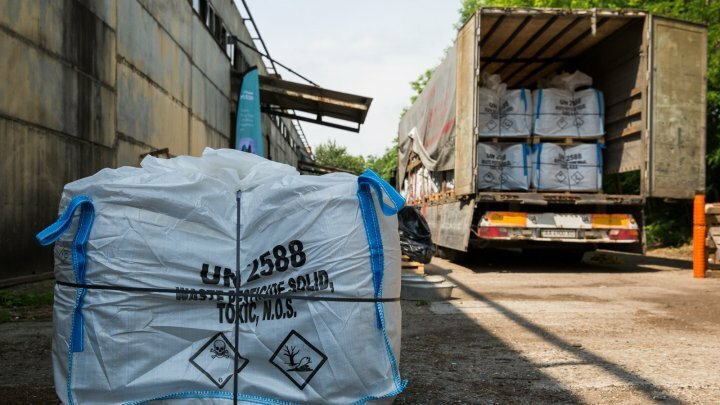 This is the last lot of the 1 269 tonnes of chemical substances collected and transported for destruction in Poland, within NATO's project. The project was worth in total 2.2 million Euro. At the event, Prime Minister Pavel Filip highlighted the importance of maintaining a healthy environment, mentioning that City Halls from the over 400 settlements where pesticide were stored have reported an increasing number of consequences in those zones. "The faulty management of pesticide from the Soviet Union caused grave consequences. We always encountered difficulties tied to food safety and ecological security. I am happy that starting today, Moldova becomes safer, not only for the consumer, but also for the supplier" Prime Minister said. The official accentuated that the successful implementation of the project proves the efficiency of cooperation between the Republic of Moldova and NATO, including at the chapter of environment. Pavel Filip expressed gratitude to all those who took part in the process of evacuating the chemicals, accentuating NATO's contribution, of partner countries, as well as of over 800 soldiers of the National Army: "You have worked in harsh conditions and today our citizens are grateful to all of you." According to the Prime Minister, authorities will continue to take necessary actions to ensure a healthy environment, it being a priority included in Moldova's Strategy 2030. Efforts will also continue the liquidation of Soviet reminiscences, which directly affected the people. "Today we have dispatched the last truck with Soviet pesticides. I sincerely wish to completely get rid of the Soviet mentality, where people waited for the state to do everything. We must work together to build a better future" Prime Minister said. For their professionalism, six soldiers of the National Army received diplomas from the Government. Pavel Filip also offered the symbol for the conclusion of the project to the ambassadors of the countries that contributed to its realization: Romania, Poland, Lithuania, Italy, Turkey and Estonia. A total of 7 245 tonnes of pesticides remained in the Republic of Moldova from the Soviet times. Starting 2003, 1 269 tonnes were packed, evacuated and destroyed in Poland, within NATO's project on destroying pesticides and chemical substances from the Republic of Moldova, while 1 976 tonnes were evacuated and destroyed in France, within other projects financed by foreign partners. In the Republic of Moldova remains 4 000 tonnes of pesticide, buried at the polygon from Cişmichioi village, Găgăuzia. Authorities are discussing with Czech Development Agency to implement a project worth 1 million Euro, to evacuate them.